This is a splendid cake, light and soft! Serve with a dollop of whipped cream if you like and enjoy it with a nice cup of hot tea or coffee! In a large bowl whisk the sugar, eggs and vanilla seeds. Add double cream, whisk, then add almond powder, flour, baking powder and salt. Whisk to combine. Fold butter and toasted almonds into the mixture. Grease an 11-inch springform pan, preferably nonstick, with butter and dust it with flour. Pour in the cake batter and rest in fridge for 30 minutes before baking. 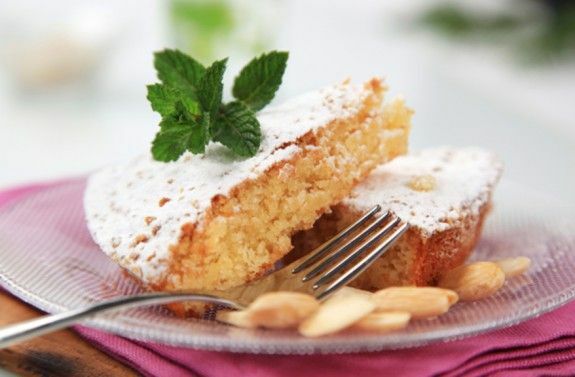 Bake almond cake for 35-40 minutes, or until it feels firm to the touch. Let cool before turning out. Let it sit to come to room temperature, dust with confectioners’ sugar and serve.